"Arrival of Bp. 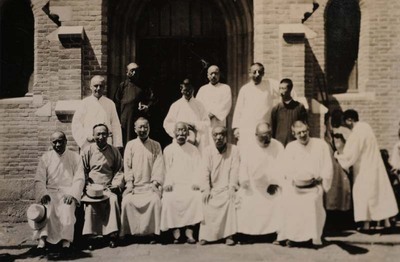 Joseph Tchang in Xuanhua"
Arrival of Bp. Joseph Tchang in Xuanhua following his consecration in Rome the month before; welcoming crowd and school children. Center: Bp. Joseph Tchang Runpo 張潤波. Arrival of Bp. Joseph Tchang in Xuanhua. November 1936. Société des Auxiliaires des Missions (SAM) China Photograph Collection, Whitworth University Library, Spokane.